The following provides guidelines for the safe use of alternative diet pills. "Burning" fat or lipotropic, increasing the use of fat for energy. 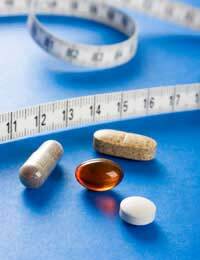 One of the major myths about diet pills and supplements is that they can be effective complete substitutes for proper nutrition and exercise. Research and consumer experience has shown that weight and health goals are either not reached or not maintained in this manner. In contrast to prescription diet pills, herbal alternatives have not been systematically researched in humans. For this reason, they are believed to not be as powerful, rather to act more to motivate the user to eat less. Further, most supplements are not regulated by government bodies at the same level as are medications. As a result, manufacturers are free to make unproven and misleading claims, and often are not required to provide safety information. Some supplements contain stimulants, such as caffeine. These can be habit-forming and lead to dependence. Some of the ingredients in supplements have been closely linked with increases in blood pressure and even organ failure - and occasionally even removed from the market as a result. Supplements limiting the absorption of carbohydrates or fats can cause gas, bloating, and/or diarrhoea in users. While not necessarily life-threatening, these effects are important to recognize. Some companies with substandard manufacturing methods enable contaminants to enter their products. These are associated with their individual set of side effects. Laboratory analysis should be provided on the products. If you take in significantly less calories than are needed for basic bodily functions and physical activity, your metabolic rate usually slows down. As a result, weight loss also slows or becomes impossible, and lost weight is regained as soon as any pills are stopped or with any increases in dietary intake. Sound resources for advice are those with no connection to a company or industry manufacturing or marketing supplements. They may include medical texts, health-related journals, websites, or preferably, licensed professionals such as dieticians, physicians, and exercise physiologists. Regardless of what you choose, always keep your doctor informed of what products you are using. Self-reporting of results may leave out key information, such as changes in diet and activity the user also undertook. Therefore, efficacy of the product may appear falsely high. Lack-of-efficacy claims by testing may be the result of subpar levels of active ingredients. Some consumer organisations also evaluate the content of the products themselves and publish the results. Finally, if you are looking to diet safely then why not take a look at www.safeslimming.co.uk where there is extensive advice on all aspects of slimming, diet and nutrition. I need some advice and guidence. I used to be active in the gym 5 days a week 5 hr sessions pumping weights and cardiovascula workouts until 2 yrs back. I had a bad incident with glass in work 4 yrs ago with my wrist and arm and lot of dammage was done in the past 2 yrs my injury has came back to haunt me and somewhat find it problematic to do gym work now. I think I have put weight on, I was a 30" waist but now a 34" waist, and lost quite a bit muscle deff. I used to have a nickname in work "tank". I have lost lots of wieght mass and chest mass, can you suggest any suppliments that will help loose weight and get my muscle mass back up as its really annoying me, johnny.